There are many things that Puna is known for, its large district size, inexpensive land prices and a colorful county council representative. Now Puna can add to its list a remarkably talented crop of cross-country runners, as the University of Hawaii at Hilo has recruited several former Big Island Interscholastic Federation runners from the Puna district. Christian Liberty Academy and Keaau High School have produced some of the talent that now showcases a Vulcan harrier squad as they prepare for the Big Wave Invitational cross-country meet to be held Saturday in Kaneohe, Oahu. Headlining a deep Vulcan men’s squad are the Ucker brothers, Keoni and Nick, who are former CLA standouts. In 2007 Keoni won the Hawaii High School Athletic Association track championship in the 1500 meter race with brother, Nick, coming in second. Another CLA distance runner, Justin Pang, had been added to the roster to give the Canefire three of the ten spots on the men’s team. Brother and sister, Nick and Nina Hagemann, from Keaau, round out Puna harriers that will compete for Jaime Guerpo’s UHH Vulcan teams. 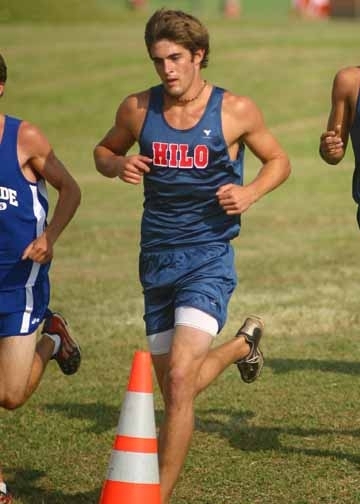 Joining the Puna contingent are former Hilo High runners Stefano Barbis and Malia Williams who are using their fourth and final year of eligibility with the Vulcan squad. Guerpo also recruited six freshmen to complement his men’s and women’s teams. The recruit class includes Pang and last year’s BIIF individual cross-country champion, Mark Turner, of Hilo. In the Vulcan season opener, Sept. 5, it was former BIIF runners Keoni Ucker and Barbis leading the way at the HPU Invitational on Oahu. Ucker finished the 8K in 26 minutes and 18 seconds (11th overall) with Barbis five seconds behind (12th overall). “We (Barbis & Ucker) got out too slow at the HPU race and we plan on going out a lot faster on Saturday,” Ucker said. “I’m really stoked about going over to Oahu on Friday and preparing for this race. We have a good group of guys and most of us have known each other for years,” Ucker said. The Big Wave meet is hosted by the UH Manoa girls cross-country team and will be held at the Kane’ohe Klipper Golf Course on Oahu. “I’ve never run on that course before and I’m looking forward to it,” Ucker said. The men will run a 5K (3.1 mile race) while the women will run a 4K (2.5 miles). Adding to the Vulcan firepower is the return of senior Garrett McAllister who led the men’s squad last year, but missed this year’s season opener. “Garrett has been training really hard and we expect to pack run along with Nick (Hagemann),” Ucker said. “It’s great having a bunch of local guys running on the team. We joke about Keaau, Hilo and CLA all the time and we tease each other about our alma maters. Our team is very close and we have bonded together well,” Ucker said. The addition of Justin Andrew, Derek Dominguez and Zach Johnson rounds out a deep Vulcan men’s roster. The Vulcan women only carry six harriers on their squad and do not have the luxury of having the large numbers like the men. “For the women we have three returnees, so we’re not as deep as the men, but we will be competitive,” Guerpo said. Andrew was the lead runner for the Vulcan wahine at the HPU race finishing in 19 minutes and 32 seconds (16th overall) with teammate Nina Hagemann trailing by 10 seconds (18th overall). The Vulcan women also include former soccer player, Lauren Viera, from Kamehameha-Hawaii, Lillian DeSmither from Hilo and Kau hurdler, Kapua Lapera. All three are in their first year with the lady cross-country Vulcans. Guerpo is in his 11th season as the Vulcan head cross-country coach. UHH competes in the Pacific West Conference, NCAA Division II cross-country against BYU-Hawaii, Chaminade, Dixie State, Grand Canyon, HPU and Notre Dame de Namur. HPU is the defending men’s and BYU-Hawaii the defending women’s team champions in cross-country.